A number of years back, West Marine carried a paste gelcoat that had all of the Catalina gelcoat colors: White, Gray, and Tan (Camel). The factory will sell you gelcoat in pint cans. It’s the correct color, but it is the type you use in a spray gun and is very thin. 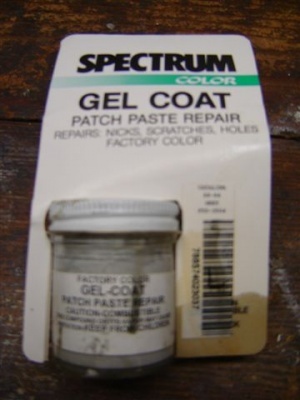 Using a number from an old patch kit I called the SPECTRUM Company in Auburn, W A. I found they still have some of the small Catalina White “paste” patch kits available. The paste is thick and much easier to use – especially on a vertical surface. They also have the thickener called “Cabosil” that mixes with the factory spray consistency and turns it into a paste. If you’re interested in gelcoat touch up you can call them at 1-800-754-5516 and talk to Danielle.